Today it rained; was fine; calm with severe gusts of wind. We probably experienced all four seasons! One of our problems with this blustery weather is keeping the covers on Waiouru. We are so close to commencing work on the interior the last thing we need is water inside the shell. Over the last few month I’ve scratched around the boatyard finding items to keep Waiouru reasonably dry. The white tarpaulin was found in one of the shelters and the cordage was lying in a large knot in the anchor shed. Six large steel pegs were lying in the undergrowth which is where I also found the bricks. Initially the tarpaulin went all the way to the ground where I’d attempted to secure it with bricks, dunnage and a few concrete slabs. 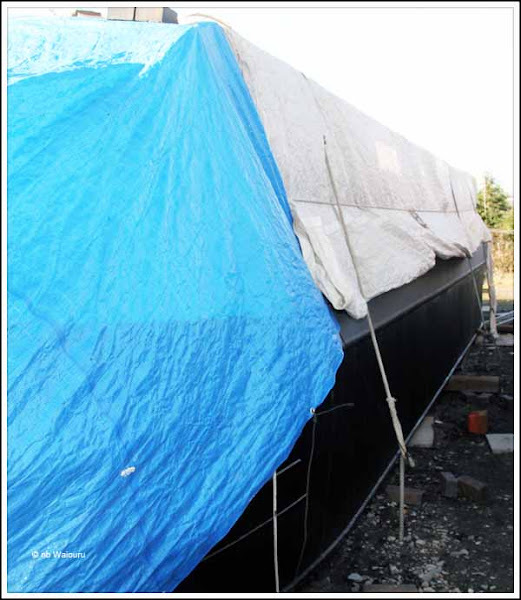 This method wasn’t very satisfactory as the wind would get under the baseplate and generate sufficient lift to pull the entire tarp off the boat. 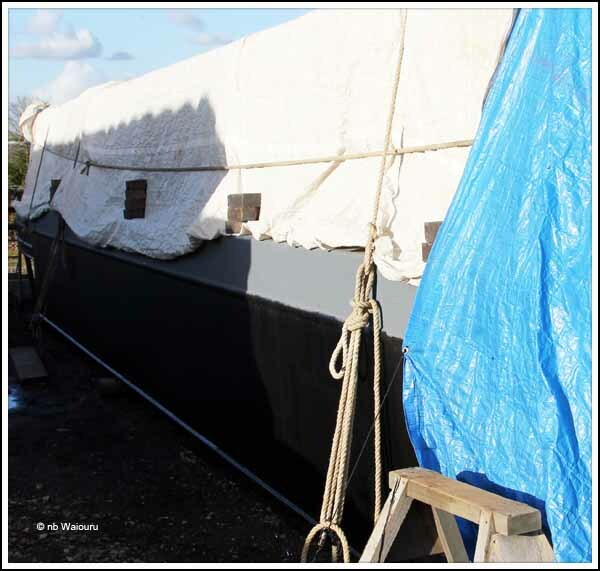 Once the shell had been grit blasted the tarpaulin was folded in half and the bricks placed on the gunwale. This method is more successful, apart from those days when the wind comes from the north. When that occurs it gets under the stern end of the tarpaulin and throws all the bricks off the gunwale. You can see this has happened in the above photo. If I’m around I just reinstate them. However if it occurs during the night I may not discover the situation until the morning. The problem won’t be nearly as critical once the portholes and hatches are fitted. The joiners have nearly finished installing the new bathroom on nb Bewick Swan so hopefully they will be fitted tomorrow.